Can An Azure Government Chatbot Reduce Email Traffic? Microsoft is really pioneering some exciting technology right now! 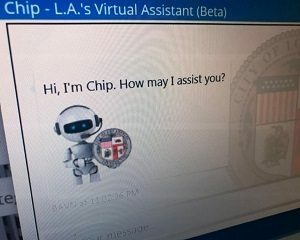 Earlier this week, Microsoft and the City of Los Angeles unveiled CHIP, an Azure Government chatbot whose name stands for “City Hall Internet Personality”. CHIP runs in the Microsoft cloud. It resides on Los Angeles’s Business Assistance Virtual Network (BAVN), and was created by two city developers in just three days, with training from Microsoft and access to the Microsoft Cortana Intelligence Suite, the Azure Bot Framework, and Microsoft Azure Cloud. – Is CHIP The Future of Government Services? Cost was unexceptional. And despite freeing up staff to handle more involved issues, Chip is a harbinger of what’s next for artificial intelligence (AI), not a mere Azure Government chatbot, said Michael Donlan, Microsoft’s vice president of U.S. state and local government. CHIP can be trained to “learn,” and has already been backloaded with knowledge more than tripling his answer base from around 200 to roughly 700 questions. He “curates” the answers from what he knows. An Azure Government chatbot can also easily connect to many different communication platforms like Facebook, Skype, Slack and websites. They also integrate with Microsoft Cognitive Services, allowing additional features like natural language processing, speech recognition, facial recognition, etc. Just image what an Azure Government chatbot like CHIP could do for your federal or state/local government agency! Is CHIP The Future of Government Services? Would you like cFocus Software to create a FREE Azure Government chatbot proof of concept for you? Click the link below!